Acrylic painting materials are relatively inexpensive. You'll need some good quality painting materials such as paints, brushes and a few other things. When buying your materials, you could be tempted to buy the cheapest items you can find. That would be fine if all you want to do is to play around with acrylics for a while, and do not have the intention to build on your painting skills. However, if you are seriously considering developing your artistic skills with acrylics, I would recommend that you buy the best quality you can find. You'll be surprised that whilst the difference in price is not really significant, the difference in quality is. Generally speaking, the best brushes are made of hog or sable. These brushes tend to last longer than the cheaper versions. Synthetic fibres brushes are ok, I suppose, and there is a large number of these at your favourite art supplies shops. However, at the risk of being called an "artistic snob", I rather prefer natural fibre brushes: filbert-shaped hog brushes and small sables. I also like bright, flats and round brushes. You should equip yourself with at least one of each. Palette knives are not brushes... but you'll be using them as such. You need this essential acrylic painting tool for mixing your paints and cleaning your palette. Later one, in the acrylic techniques section, you'll see other ways of using the palette knife. There are different types of palette knives available. Whatever types you choose, make sure - whenever possible - to include a cranked palette knife. 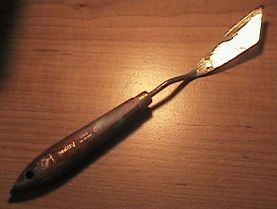 You should also buy small flexible painting knives, as you may want to experiment with some rather creative acrylic painting techniques as you progress in your skills. As for painting palettes, acrylic painting is better used with a plastic palette, which you can clean with cotton rags. You should also get a couple of water containers or "dippers". One will be for water, and the other for your acrylic paint. Additionally, you'll need a jar of water to rinse your brushes. A glaze is a medium you use to lay on thin layers of paint to increase the acrylic's transparency and adhesiveness. extend the setting time of acrylic paint (this is particularly helpful when working on a warm day, when your acrylic paints dry faster than usual). As for varnish, you use it to protect your acrylic paintings. There are 2 main types, namely gloss and matt. Having said that, I still prefer using a diluted layer of glaze to protect my paintings... but that's only one of my personal preferences. You'll also need to get an easel when painting with acrylics (or with oils, pastels, or any other media). There are different types of easels, and they differ according to where you intend to use them. If you intend to use them in your studio, a simple radial easel will do the job just fine. However, if you intend to do outdoor painting with your acrylics, you should use a painting box instead. Sketching easels can be too light and unstable for you to use outdoors. Thus, if you can manage to get a painting box with telescopic legs, you'll enjoy the best of both worlds: a steady "easel", and a great box to store your painting tools and materials. The only disadvantage, though, is that a painting box can be rather heavy to carry, but that is a small price to pay compared to the convenience and stability a painting box offers. There are 2 main types of acrylic paints you can purchase: Standard and Thin. Standard acrylic has the same consistency as oil paint, and thin acrylics is a bit more liquid (you use it for even layers of paint, when required). To decide what type you want to use, you should experiment with both using different acrylic techniques. There is yet another type of acrylic paints: The Polyvinyl Acetate Colors, which is basically the cheap range used at schools for art classes. Whilst I do not recommend their use for your masterpieces, you may want to use them to explore your artistic endeavours.